Congratulations to Alessia Vignoli! 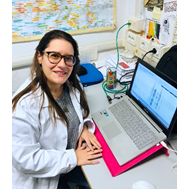 She won the two-years AIRC fellowship “Eduardo Spinnato”.”METabolomic profile as a prognostic biomarker of risk of recurrence in patients operated for COLon cancer (METCOL)” is the title of her research project. The project will be carried on thanks to a strict collaboration between Cerm (Prof. Claudio Luchinat research team) and the Medical Oncology Department at Hospital of Prato (Dr. Angelo Di Leo equipe).